Solatube Dome is made of injection molded high impact acrylic/polycarbonate with UV inhibitors. The patented LightTracker® & Ray bender 3000® technology harnesses maximum daylight during the early morning & late evening hours to deliver uniform light throughout the day. The Spectralight Infinity tubing in Solatube has a spectral reflectivity of 99.7%. The highest in its class. The proprietary Cool Tube technology in Solatube prevents I/R infiltration and ensures no additional Heat Load on the building. The engineered prismatic diffuser in Solatube has a number of micro-prisms which diffuse the light over a wide area underneath. Different Diffuser options available for different applications. No. of Solatube DS required are much lesser for the same room size as compared to competitors. Others' dome is made of thermoformed Polycarbonate. Unable to maintain uniform light during early morning & late evening hours. Do not have effective I/R blocking capability, thereby adding to the Heat Load on the building. No different diffuser options available for specific application. One size fits all ! Other known brands of Tubular Daylighting Systems do not have any technologically advanced systems to enhance the light harnessing, transferring & delivery functions. No. of units required are higher to achieve the same Lux level in the same room size as compared with Solatube DS. Along with Light Transfer Efficiency, the tubing in a TDD system plays an important role in the quality of light output as it relates to Color. Color Temperature Maintenance (CTM) is a measure of how well a system can deliver reflected light without a color shitt. 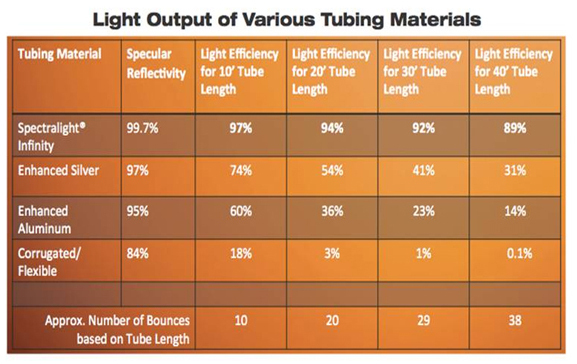 Tubing materials have different performance ohareoterisﬁcs. and some transport light more efficiently than omens, Spectrelight Inﬁnity Tubing, found in Sotalube Dailigtiting systems. is made of the most reflective material in me world. and ranks at the tap for delivering the ml-m'Inum amount a light over the longest distances. Contrary to Total Fletiectance. 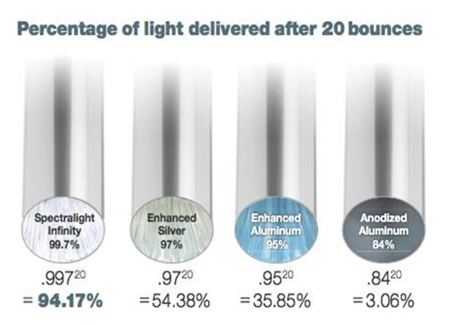 Specular Reflectance is a key factor in determining an optical tube's efﬁciency in transferring light, and manufacturers should provide Specular Reflectance data to demonstrate the true efﬁciency of their TDD systems. To translate light output into practical applications, Sclatube lntemational uses a Design Calculator to evaluate a space by factoring geographic location, time of day and time of year daylight measurements based on the room characteristics, occupancy, and speciﬁc Sclatube Daylighting System product conﬁguration, including tube length and signiﬁcant angles. This will develop a custom light study designed to meet speciﬁc lighting criteria. SOLATUBE products carry a manufacturers Worldwide warranty for 10 years. Others offer a warranty ranging from 5-20 years. Solatube is a reputed corporation in existence since 28 years. Solatube is the worldwide market leader with presence in over 110 countries. Do the competing brands have a past record to honour the warranty condition ? ?